I began in a city space. It was late morning here. So in this city there were a lot of tall buildings, car noises – engine and car horns, exhaust smells, a thickness in the air. There weren’t specific people or cars here but their presence was felt. The energy felt busy and pressured. This feeling of pressure is making it hard for her to take in her surroundings. 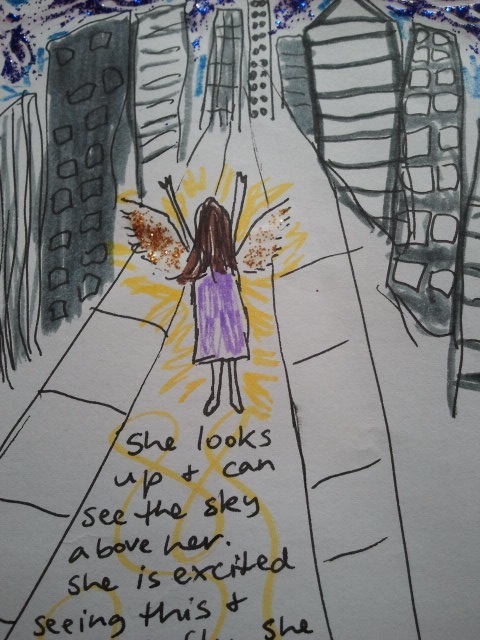 She looks up and in the small spaces between skyscrapers and where the streets are, she can see pieces of sky. Blue, fluffy clouds, inviting and promising. She decides to fly. She has feathered white and grey wings that unfold and flap as she moves upward. She didn’t realise she had wings but they work naturally as though she has been doing this her whole life. Upward she goes past the highest roofline of the city. Up here the air feels fresher already and she feels like she has space to breathe. She looks around and can see a small island area which is just East from the city. She sets her sights on this and flies to this. As she gets closer she sees the island is thick with trees and grass. Not much else is visible from high. She is happy to leave the city behind her. She comes to land on a grassy shore. Her bare feet feel soft on landing and the grass is slightly damp. Her wings fold in and she heads into the thick forest. It gets cooler quickly due to the thickness of the trees overhead, and darker too. The air smells damp and she feels goosebumps on her skin. She hears a crunch of twigs and turns towards her right. Standing there is a figure with a pale skeletal face and dark clothes. It is hard to tell their intentions due to an unexpressive face but she assumes that as they stand there holding a staff that they aren’t going to be positive. But she is unafraid and says “You don’t scare me”. Once those words have left her mouth, this figure’s dark clothes fall to the ground as though they were full of air, the skeletal face smashing as it hits the ground. She continues forward and soon finds a clearing. Here there is a black iron cauldron containing a gold liquid and a lit fire underneath it. The warmth is comforting and soothing to her. Using a wooden implement left beside the cauldron, she stirs it, her intention focused squarely on this gold liquid. She is expecting to see something yet nothing is appearing to her. I use EFT and tap for her not being able to see what she needs to. She stirs and looks again and within the cauldron, created with the ripples and shadows of the gold paint she sees that it is an image of her smiling face. The image lifts her left hand, looks at it and opens it. Sparks glitter from her open hand. She repeats the same with her other hand and again sparks are released. This image of her is letting go. The image with her hands down now begins to twirl and spin with her arms stretched outward, with a blissful expression on her face. The aspect feels a warmth and excitement in her heart. She stands back from the cauldron and focuses her energy on it and the gold liquid. After a short time there is a rumbling and vibrating and the contents of the cauldron shoot upward to the sky, looking like a radiating column of gold light. It goes upward to the sky and then filters outwards until the surrounding area as well as the city are coated in this gold liquid. Content and elated, with peace in her heart, the aspect finds a comfortable place in the forest, curls up and falls asleep. This is from a habitat that I haven’t yet blogged about. The experience/habitat is incomplete which might be why it’s playing on my mind a little. My children were doing some artwork at the table with me, hence the glitter and Crayola markers that I added in. This aspect finds herself in a city. Stifled in a city. And just by looking up at the sky and seeing its’ blueness she is inspired to take flight, with wings she didn’t even know she had. Where does she go and what does she find? More on that later! This habitat is reminding me not to analyse things as I’m going, that it’s okay not to know where things are headed, and it’s okay not to have already known the answers to the questions I’m asking.